Superior performance combined with superior comfort... in Fingergrip style! Ideal for officiating in large indoor stadiums or outdoor arenas. Provides additional comfort. Distinct louder pitched whistle provides a much powerful sound, without a lot of effort. Easily heard over the crowds. Ideal for large outdoor arenas with big crowds and extensive ambient noise. 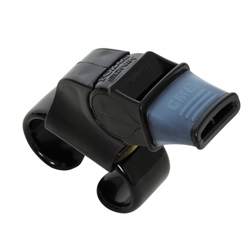 Reliably hold the whistle in mouth or fingers in wet conditions when officiating outdoors.